Pakistan Telecommunications Company Limited (PTCL) congratulates Islamabad United team on its magnificent win on the final of PSL3 played at National Stadium Karachi. 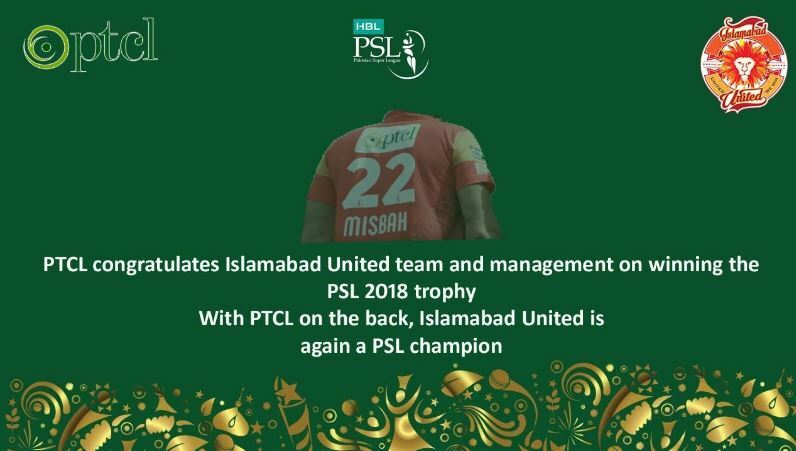 PTCL is the official partner of Islamabad United in PSL3, with its logo seen prominently on the back of the shirts worn by Islamabad United players. It was heartening to witness the excitement, enthusiasm and emotions of millions of cricket fans across Pakistan connected through cricket and PTCL with Karachi at its center stage. The Islamabad United team’s performance was remarkable throughout the Tournament, and their victory was an outcome of brilliant cricket played by all its players. PTCL is proud to be a partner again of the team who has won PSL 2018.